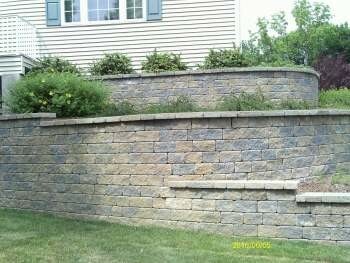 A retaining wall is the silent servant of your property. Usually unseen and unremarked-upon, it serves the fundamental purpose of guarding against erosion and ensuring soil and land stability. Having built retaining walls since 1993, we know a thing or two about them and would be delighted to put our specialized knowledge to your use. First, a retaining wall does not have to be unseen and unremarked-upon. A vast variety blocks, from rough hewn to finely finished and polished, can be used to build an eye-catching retaining wall. Let AAP Construction regale you with choices! For a classic look, you can have identically-shaped and -sized gray granite blocks, or go for a modern, South-Western style using bricks in bright monotones in an assortment of sizes and shapes. Choices in retaining walls are manifold. Call us at (973) 298-1013 and find out how you can complement your house and set off your garden. That said, a retaining wall also serves a practical purpose and sometimes is a necessity. Typically a retaining wall is necessary when your property is situated on land that is on different levels; as a result, requiring the earth to be 'retained' on these different levels. Since 1993, we have been building retaining walls that prevent erosion and stop soil from sliding away. Do you by chance own a sloping property? If so, a retaining wall is specially important for you as it protects foundations by guarding packed soil and subsurface earth from sliding away after rains. Though AAP Construction is a full-service masonry company, we won't charge you an arm and a leg. Phone us at (973) 298-1013 for a free consultation and quote – you have nothing to lose!